Beautiful hard-surface floors can be one of the most impressive features of your facility. When regularly and correctly maintained, they can do more than create good impressions on your employees and guests. Attractive, well-maintained floors can help enhance your professional image, while providing a clean, safe working environment. Count on ServiceMaster Clean® to keep your hard-surface floors looking their best. Whether they are vinyl, ceramic, marble,quarry, tile or other materials, we will custom design a care plan for your needs. ServiceMaster Clean uses the best floor care products and most innovative equipment and methods for optimal effectiveness. Combined with our 50+ years of experience and extensive research and development, we have the expertise to service hospitals, schools, grocery stores, retail stores, high-tech and many other kinds of facilities. 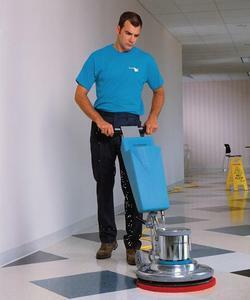 Maximize your hard-surface floor investment with a care program from ServiceMaster Clean.